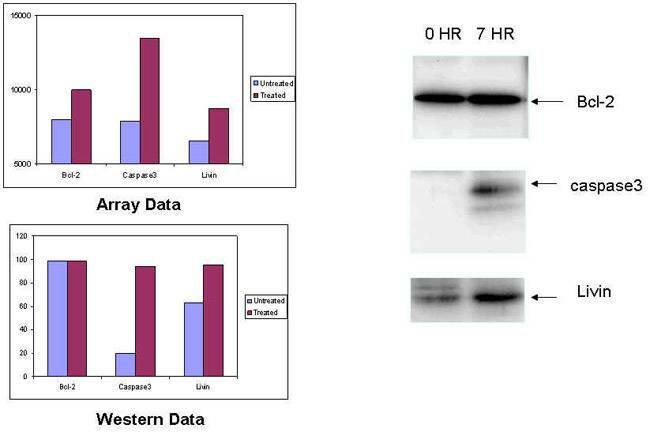 Apoptotic protein profiling in drug-treated Jurkat cultured cells: Jurkat cells were treated with Apoptosis Inducer Set (BioVision, Inc. cat# K121-5) for 7 hours (10mM Actinomycin D, 2mM Camptothecin, 100mM Cycloheximide, 10mM Dexamethasone, and 100mM Etopiside). 500 mg of cell lysates from both induced and uninduced Jurkat cells were incubated overnight with RayBio® Human Apoptosis Antibody Array membranes. Control membrane was incubated with blocking buffer. The membranes were then washed and cocktail of biotinylated antibodies was used to detect bound proteins. After incubation with HRP-streptavidin, the signals were visualized by chemiluminescence.